A petrifying flash of lightning! It is astonishing to think that a split second of stormy weather can be captured in stone. This is is exactly what happened when a bolt of lightning struck drifting sand near Drigg, in Cumbria. The intense heat fused the sand grains together to form the delicate glassy tube you can see below – a fulgurite. In fact three fulgurites were discovered in 1812, all quite close together. It is thought they represented different forks of the same lightning bolt. The glassy tubes, coated with grains of sand, ran for several metres underground, tracing each fork’s galvanising path through the earth. These unusual natural formations get their name from ‘fulgur’, the Latin word for lightning. Damp sand conducts electricity, and when lightning strikes, the sand grains fuse to form a glass composed of nearly pure silicon dioxide. The Drigg fulgurites were a famous discovery; even Charles Darwin knew about them. He wrote that the fulgurites he had discovered in South America looked very similar to those found in Drigg. 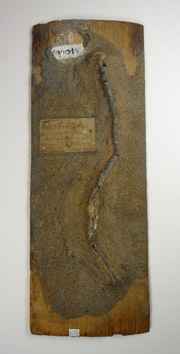 This fragile fulgurite and its surrounding sand have been cemented to a piece of wood. The handwritten label gives the German names ‘Fulgurit. Blitzröhre’ and continues ‘formed where the lightning is striking into sandy soil’. The German scientist Dr Fiedler had first described the fulgurites of Senner Heath (Senner-Haide) in 1817. 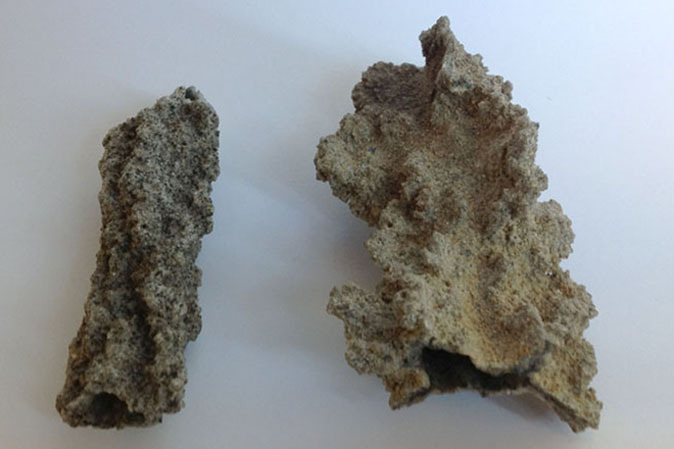 Today, fulgurites are known from many places around the world. Their discovery in the Sahara desert shows that it was once less arid than it is today.